As I’m limping around the house this morning it has actually hit me … We ran TWO half marathons in THREE weeks! Not everyone does that! I feel so proud! I am twice as heavy as some of those competitors. I look like I couldn’t run 21 metres let alone over 21 kms. Sarah, we got up for 5 am training runs, contended with moving house, EQC, living with parents, dying grandparents, let alone the usual life stuff of working, studying and raising kids, but we didn’t let it stop us! What legends we are! Our awesome PT, Cate Grace, has been the perfect trainer for us. She totally believed we could do it, and therefore so did we. Our LEAP tribe has been the perfect mix of laughs and support! What an amazing feeling of accomplishment! P.S. the photo shows Sarah on the left and me on the right. 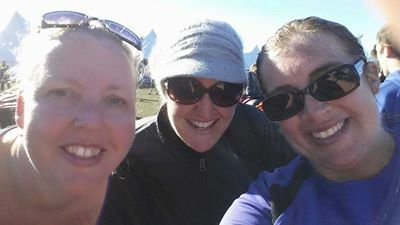 In the middle is my lovely friend who came down from Wellington to cheer us on and ended up running a personal best time too! A great day! Emma is trained by Cate Grace and this story went into the 2014 Week 8 Winner’s Weekly.